This was my entry for the BrickFest 2002 Animation Competition. It won the conference organiser's award. To be honest, at first I was really disappointed that the basis of this comp was to be StarWars lego, as there are SW lego films all over the place. I thought they had been done to death. Then Bluntman ( Bluntman's Bluntmations ) unleashed his entry for the comp and I was blown away! After carefully storyboarding the film (storyboards to appear soon) I realised I needed a Tatooine backdrop. I hit the web, found some tatooine/tunisia websites, grabbed some images, blurred them a bit and printed them out on my bubblejet printer... I think they turned out quite well! Filming was great fun, especially the moving landspeeder sequence, and I'm quite proud of the little Sith Speeder I came up with as well. The longest part of the process was the rotoscoping, as I was extremely picky about this. 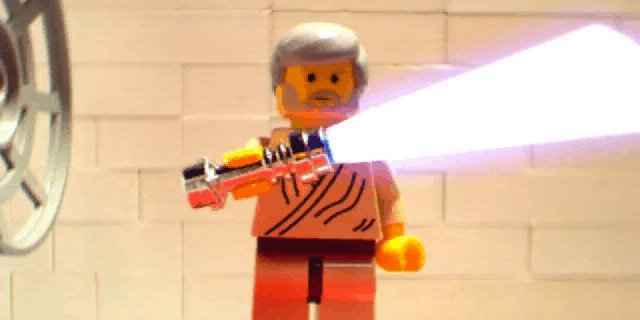 I knew the crux of the film would be the duel, because to me, light sabers ARE the defining element of StarWars. Near the end of editing I discovered the final sequence happened a bit quickly, so I used videomach to adjust the frame rate very slighty so as to keep the impression of speed and smoothness of animation as good as I could, but to slow it down ever so slightly. I think it worked.